Deborah Heneghan was fifteen when her seventeen-year-old sister died of cancer. A few weeks later, she woke in the middle of the night to a faint whisper summoning her. That was the beginning of Heneghan�s communication with her dead sister, one that continues to this day. In Closer Than You Think, Heneghan shows how she began to recognize the signs and messages from her sister. She shows readers how to get back in touch with deceased loved ones and find guidance and a helping hand from their big-picture perspective in the beyond. Filled with tips, tools, strategies, and stories to help the reader make contact, Closer Than You Think will give you hope, comfort and peace that your loved ones do �live on� and are engaging you in a very real way. Readers learn how to connect and communicate with their deceased loved ones and remain close to them in a natural, healing way. 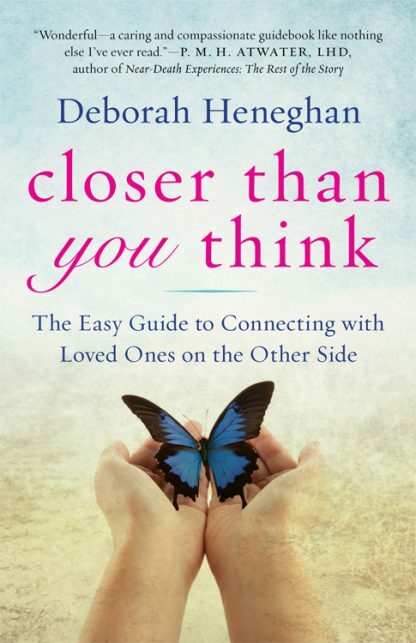 For anyone who has lost a loved one and is trying to develop a clearer connection with them, Closer Than You Think provides hope, comfort and peace that loved ones do live on and are engaging us in a very real way. Deborah Heneghan is a working wife and mother who has been communicating with her dead sister for over 20 years. She is the founder of Closer Than You Think, a national resource for after-death communications, grief management and learning how to live a more spiritually fulfilled life. She has her own weekly radio show, and has appeared on Lifetime TV, and programs on ABC, CBS, NBC, and Fox.